Mohamed at a barber. Southern Morocco. Mohamed, a young and unemployed Moroccan looks at the sea in southern Morocco. Mohamed walks back from the port in Sidi Ifni after his first attempt failed. The traffickers didn't have a boat and stole his money. 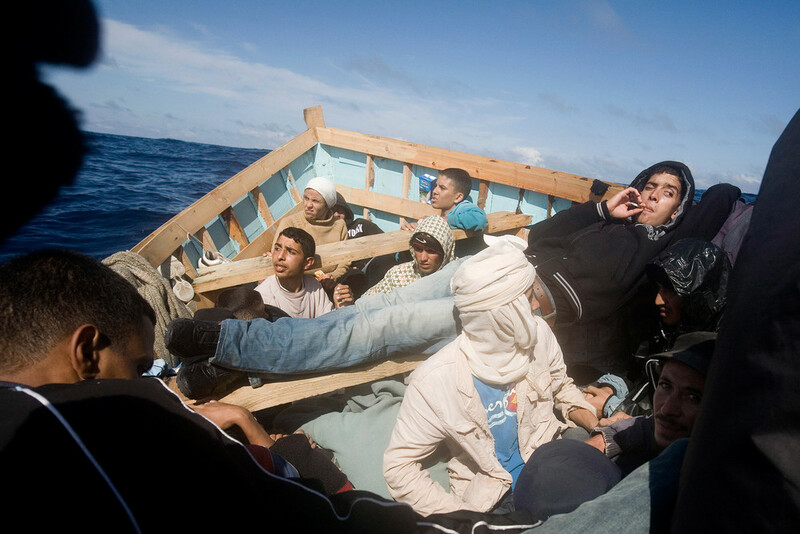 Young Moroccans pushing a plastic boat into the Atlantic Ocean to try to sail illegally to Spain's Canary islands. The boat sunk after a few waves, around 2am in the morning. Mohamed sleeps in the afternoon in a house of a friend in southern Morocco. He is trying to make contact with smugglers for his first attempt to try to illegally sail to Europe. He would eventually succeed to reach Spain by boat on his 3rd attempt one year from now. Mohamed killing time playing soccer on a beach in South Morocco while waiting to hear from traffickers. 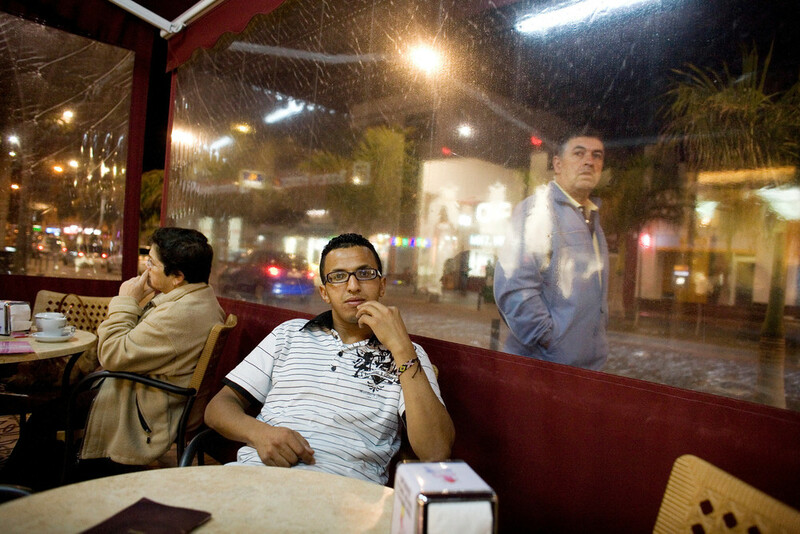 Mohamed and Ahmed in a restaurant, they suspect that the traffickers they gave money to stole it. Mohamed and Ahmed try to reach a smuggler by phone. 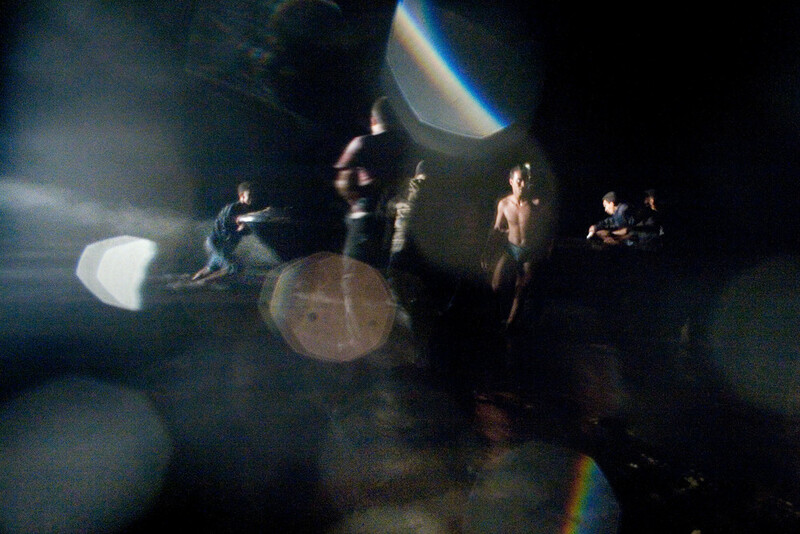 Mohamed travels early morning with other migrants in the back of a minivan away from the port of the coastal town Sidi Ifni after their attempt to get into a boat heading for Europe failed in the night. Migrants push a makeshift boat onto a Land Rover to drive through the desert to the Atlantic Ocean and try to sail illegally to Spain's Canary Islands. 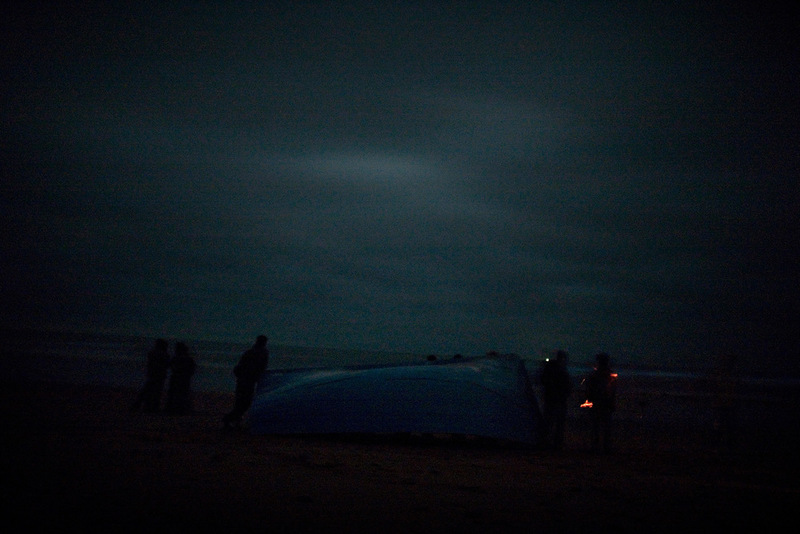 Preparing the boat on a beach and waiting for the right current to sail the Atlantic Ocean to Spain's Canary Islands. Mohamed sails illegally to Spain's Canary Islands in a makeshift boat, the blue paint is still wet. The trip over the Atlantic Ocean will take more then 34 hours. Migrants sail illegally to Spain's Canary Islands. seen on the horizon. Migrants try to reach Spain's Canary Islands. Migrants arrive on Spain's Canary Islands after sailing the Atlantic Ocean for more then 34 hours. They arrive on a small island, La Graciosa, north of Lanzarote and are all arrested within one hour. Mohamed calls home after he has just been released from prison on the Canary Islands. The Spanish authorities couldn't determine his origin and let him after one month out of prison. 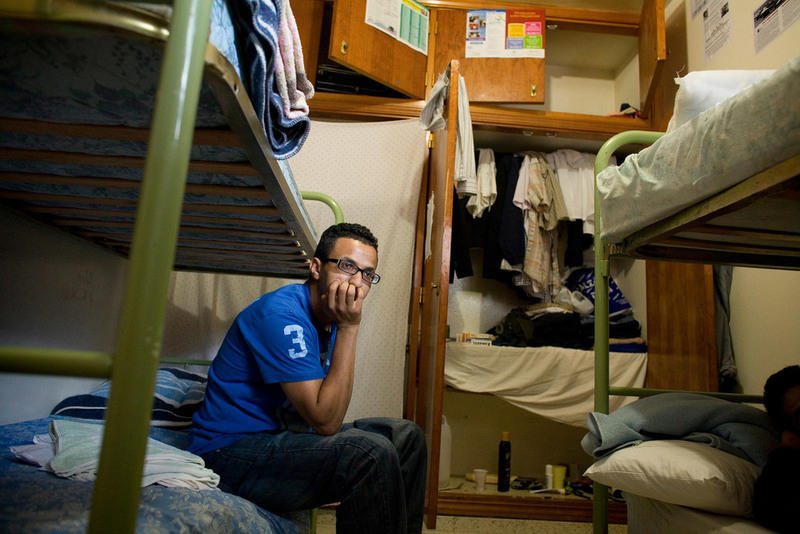 24-year old Mohamed in the room of a shelter where he is staying while he is applying for asylum. He later had to leave the place after his asylum request got denied after which he traveled to mainland Europe. Mohamed waits in line for food aid distribution at a church. 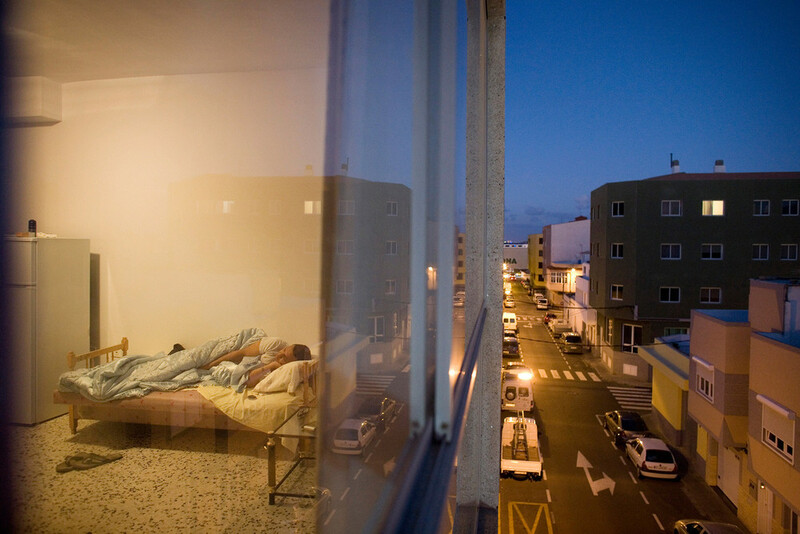 Mohamed, a 25-year old Moroccan, in a room he shares with Mounir who came to Europe by hiding in a truck. Mohamed at night in a Bolivian nightclub in northern Spain with Moroccan friends. Mohamed on a terrace close to the shelter where he is staying while he is applying for asylum.